This auction was won by D***d.
Courtesy of Visit Natives Finland, Enjoy a once-in-a-lifetime 3-night, 4-Day Sami & Reindeer Experience in Kautokeino, Northern Norway for one guest. The tour will be hosted by Nils Sara and will include sledging with reindeer, Northern Lights Safari by night, traditional tent evenings and untamed Arctic wilderness as well as accommodation, food, beverages and collection and drop-off to Alta Airport, valued at approximately €1,630 EUR / £1,515 GBP / $1,960 USD*. Prize stay dates: to be booked in advance and taken on one of the following dates: 08 – 11 January 2018, 22 – 25 January 2018, 05 – 08 February 2018, 19 – 22 February 2018, 05 – 08 March 2018 or 26 – 29 March 2018, subject to availability. Visit Natives was started by Anniina Sandberg, whose passion for true-to-life and authentic native travel experiences around the world inspired her to create tours in Finland and neighbouring countries where the Sami people live. She wanted outsiders to feel welcomed and at home and to experience local traditions, feasts and a taste of the real Arctic wilderness, that you simply can’t experience on a package holiday or from a luxury hotel. 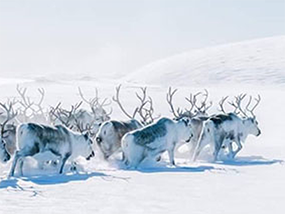 Visit Natives gives everyone the opportunity to immerse themselves in the local culture and traditions of the Sami reindeer herders, whilst providing sustainable indigenous tourism in Lapland. Prepare yourself for a real Arctic Lapland adventure! This auction is for the unique chance to get up-close and personal with the untamed arctic wilderness of Northern Norway, experiencing the magical Northern Lights and riding with reindeer – if this isn’t on your bucket list, then I don’t know what is! This is a truly authentic Arctic experience and the winner will stay in a rustic and basic heated wooden cabin in the wilderness with a separate heated toilet in an adjacent building (no shower). Bed linens and towels are included. In keeping with the traditional experience, guests will dine on traditional Sami food including reindeer meat, salted fish, berries, bread and more. As part of the stay Thermal Clothing will be provided, which includes warm overalls, boots, gloves, hats and helmets for snowmobiling. Before hitting the road, the winner will enjoy a traditional Sami lunch. After a car journey for a few hours, the winner will then enjoy a snowmobile ride into the mountains and to the cabin for the night. The winner will experience reindeer herding and try reindeer sledging. The evening is spent in a traditional tent. The winner will visit reindeer grazing freely somewhere in the Arctic wilderness. Later on, there will be Sami joik singing, trying traditional Sami clothes and in the evening the winner will take an enchanting Northern Lights Safari. After breakfast, the winner will be taken by snowmobile and car back to their pickup location. Please note: the winner will join other guests on this amazing group tour (Group sizes vary from 1-6 guests). Luxury Travel Diary terms and conditions apply. *This auction item is valued at approximately €1,630 EUR by Visit Natives Finland – please note this valuation is the list price provided to Luxury Travel Diary by the Auction Prize Provider and should be used as a guide only as cheaper discounted rates may be available. No cash alternative is available. This auction item excludes flights and transport except for the local airport transfers mentioned above – you will need to arrange your own flights / transportation to and from your home to Alta Airport to coincide with your booking. Your tour is subject to availability, must be booked in advance and taken on one of the following dates: 08 – 11 January 2018, 22 – 25 January 2018, 05 – 08 February 2018, 19 – 22 February 2018, 05 – 08 March 2018 or 26 – 29 March 2018. Winners must pay for their auction item in full via Paypal within 48 hours of the auction end, otherwise Luxury Travel Diary Ltd. reserves the right to offer the auction item to the next highest bidder with immediate effect. To the fullest extent permitted by law, Luxury Travel Diary will not be liable for any loss or damage arising out of the winners’ use or enjoyment of the prize; and the winner acknowledges that Luxury Travel Diary accepts no responsibility whether directly or indirectly for any claims whatsoever arising in respect of the prizes provided by third party providers or sponsors.